"Let the children come unto me"
We teach children Biblical lessons in a fun way. We have our children remain in the sanctuary for the Sunday worship time, and then during the sermon, they have a special lesson geared to their age group in the Education Wing. After the Sunday worship segment, our younger children (3rd grade and down) are invited to come to the front of the Worship Center for a special Children's Message. Biblical lessons are illustrated with an object lesson and "audience participation"
Following the Children's Message, children in preschool through 6th grade are invited to go to the Education Wing for a snack, Bible stories, crafts, discussions, games, object lessons and more. The Nursery for ages 0 -3 is staffed by trained personnel during Sunday School and the service. ​There is a cry room in the back of the sanctuary for your use, if desired. Children and youth from 4th grade through college age are encouraged to become part of Olivet's Puppet Program. OBC has two puppet teams, Triumphant and Talking Hands Puppeteers. Triumphant is for children 4th grade through 8th grade and is our beginner team. Children on this team are taught basic puppeteering skills and perform several times during the year for the church. Triumphant will begin rehearsals in September. Talking Hands Puppeteers is the senior team for junior high through college-age members. Talking Hands Puppeteers are taught higher level puppetry skills, such as double arm rods, and travel in the community performing as well as performing at the church. Talking Hands Puppeteers has performed at the Holt Farmers Market, the Holt Hometown Festival, Hilltoppers Senior Day Care Center, and the Holt Senior Center. Talking Hands Puppeteers also attends state puppet festivals and will be competing in 2014-2015. 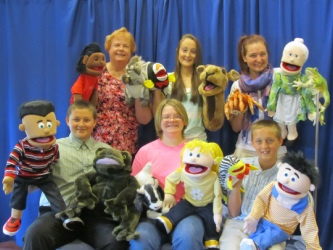 For more information on Olivet's Puppet Ministries, contact Ann Sincox at sincox.ann@sbcglobal.net or 517-256-2312. 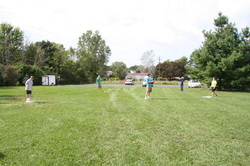 Throughout the year, Olivet families participate in a variety of events including Youth vs. Geezer Kickball Matches, trips to the beach and local parks, Vacation Bible School and more. Please check the Calendar for upcoming events! 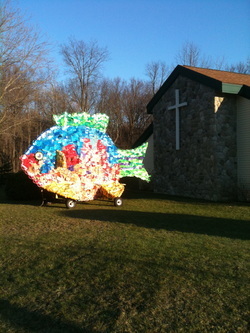 Each year, OBC plans special programs for both Christmas and Easter. Using original scripts, the programs are tailor-made to match our children's abilities. Our Children's Choir, made up of ages 4-2nd grade join both Triumphant and Talking Hands Puppeteers in a program presented before the church. For more on OBC's Creative Ministries, look under our Ministries tab.